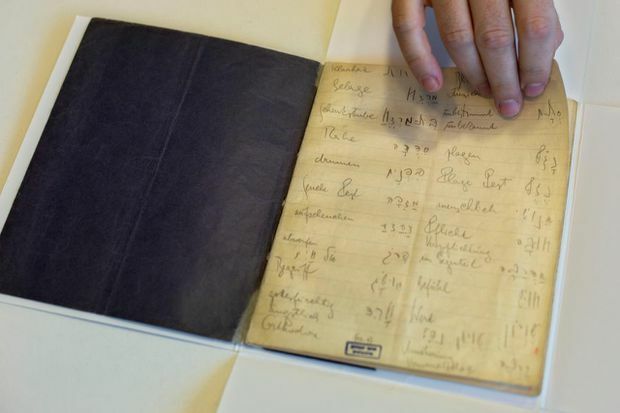 In this file photo taken on Oct. 5, 2014, a library official shows celebrated author Franz Kafka's Hebrew vocabulary notebook at Israel's National Library in Jerusalem. Kafka bequeathed his writings to Max Brod, his long-time friend, editor and publisher, shortly before his death from tuberculosis in 1924 at the age of 40. He instructed his protege to burn it all unread. Brod ignored his wishes and published most of what was in his possession – including the novels “The Trial,” ”The Castle” and “Amerika.” Those works made the previously little-known Kafka posthumously one of the most celebrated and influential writers of the 20th century.